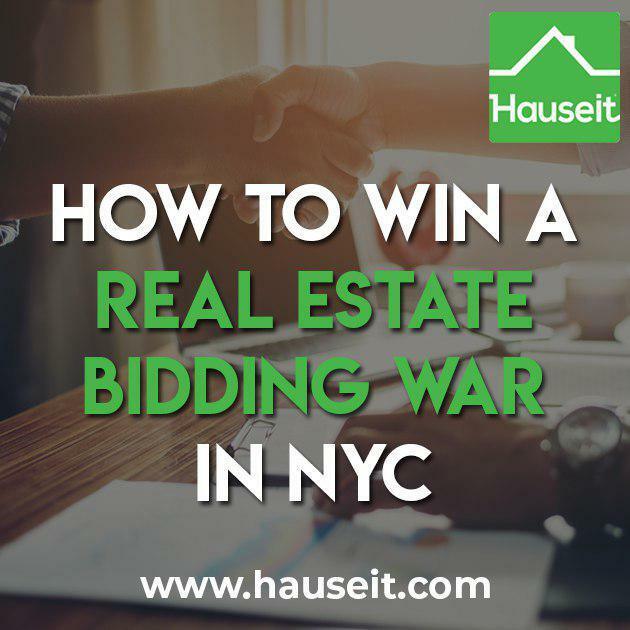 How should buyers and sellers approach a real estate bidding war in NYC? 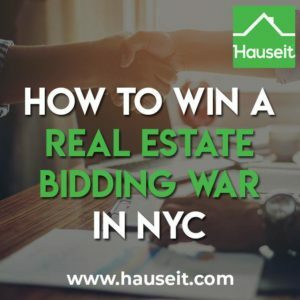 We’ll explain everything you need to know about real estate bidding wars in NYC and best practices and tips for both buyers and sellers. 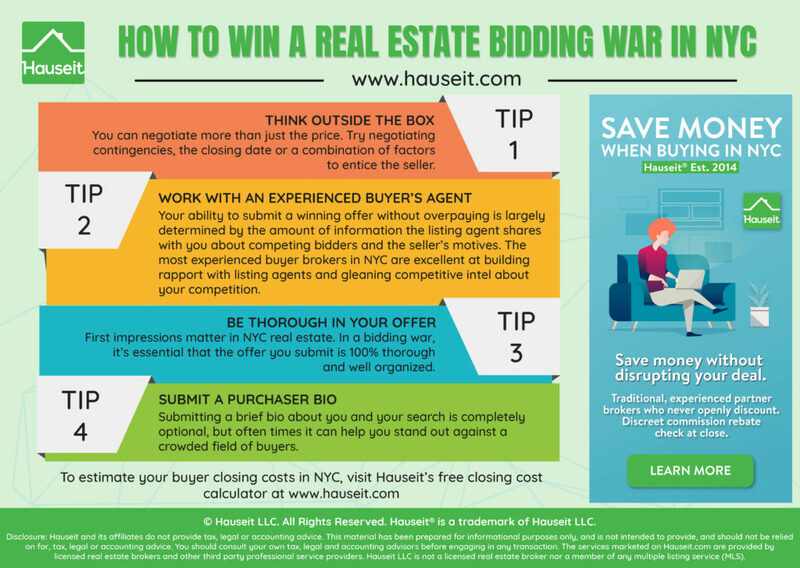 What Is a Real Estate Bidding War? A real estate bidding war is a situation where there are multiple interested buyers and offers to purchase a property. Due to the real or perceived competitive atmosphere, buyers will try to outdo one another in a real estate bidding war and often drive the final sale price well above the listing price. Often times, the seller will hold a best and final offer process if there are multiple interested parties. However, a bidding war can happen even if no best and final offer auction is held. There are no rules around bidding wars in NYC. Bids can be due all at the same time if there is a best and final being held, or they can arrive in no particular order if no auction is being held. Pro Tip: Are you getting interested in earning some of the built in broker commission for yourself? 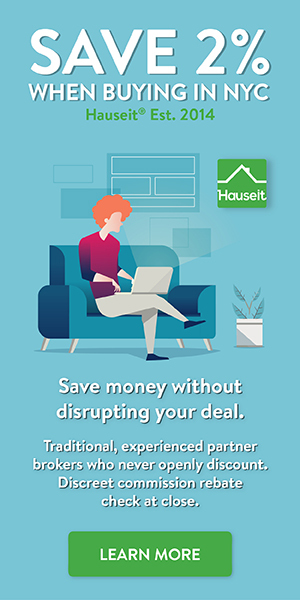 It’s completely legal and possible to do so through a Hauseit Buyer Closing Credit. The first step is to read our article on the concept of co-broking to see how commissions are split among brokers. The first step is to find a real estate agent who is trustworthy, reliable and competent. We recommend checking out one of our seasoned partner brokers who will not only provide you with free advice throughout your home purchase, but who will also discreetly provide you with a buyer closing credit worth $20,000 or more on the average NYC home purchase. Once you’ve hired a buyer’s broker, please provide your agent with a REBNY Financial Statement, a mortgage pre-approval letter, your attorney’s contact information, and a short biography or home buyer offer letter. All of these should be attached to a simple offer email which is presented by your buyer’s agent and sent to the seller’s agent. Hi George, we are pleased to submit the following, full asking price offer of $3,000,000 for 111 East 68th Street #3A on behalf of our client Jim Barbie. The offer is contingent on financing, but Jim can put down up to $2,000,000 if need be. This offer is also contingent on the sale of his current condo in the Meatpacking District. However, that deal is already in contract (please see attached for a fully executed contract). Jim works at Dorian Bain Private Bank and is the head of their commercial real estate division. His official titles are Senior Vice President, Head of Commercial Real Estate. As you can see from his financials, our client will have no debt of significance after his sale closes, and he’ll have assets in excess of the contemplated purchase price here. Furthermore, the buyer for his Meatpacking District condo has received a mortgage commitment letter which means there really aren’t any hurdles left. Lastly, would the seller be open to essentially renting the place to him in advance of a closing (i.e. reverse of a residential leaseback agreement or seller occupancy post closing agreement)? He’s leaving his current place in 2 weeks, and since your client’s place is empty why not earn some income? He’s happy to post a deposit and rent etc in advance. Please confirm receipt and let us know if we can do a deal! Thank you! Mike, we are pleased to submit the following above asking price offer of $2,510,000 for 212 Fifth Avenue Apt 4 on behalf of our client Dylan Jones. This offer is contingent on financing. Please see attached for a pre-approval letter and a REBNY Financial Statement. For conservatism, we did not include a gift from Dylan’s aunt of $1,000,000 that he can take if required by the co-op. Dylan has an attorney on standby ready to review the contract ASAP. Please confirm receipt and let us know if we can do a deal. Thank you! Pro Tip: Make sure your loss factor isn’t too big when you measure square feet. Be especially careful when buying a new construction home in NYC as sponsors can be very aggressive in how they measure square feet! You should aim to make your offer as attractive as possible when faced with competing offers. That means removing any contingencies that you can and sweetening your offer price if possible. We recommend making your offer price a bit random. For example, if the listing price is $1,200,000 and you intend to come over the top with an offer of $1,250,000, then you should adjust your offer to be something like $1,251,888. That’s because other competing buyers will likely bid in standard increments of say $50,000 in this example. If you have a unique offer number that gets you effectively to the same place, not only will your offer stand out in the seller’s mind, those extra few dollars might make a difference! Jones, we’re pleased to present the following all cash offer of $10,250,000 for 302 West 85th Street on behalf of our client Caroline Warburg. This offer is not contingent on financing and our client would be happy to show proof of funds if there is something to do. Their lawyers are on standby to review a contract ASAP. Pro Tip: Consult with your mortgage broker or bank as well as your real estate attorney before waiving your mortgage contingency in NYC. You should also consult your listing broker if you need to sell your home first before you can buy. You should discuss with your attorney whether it makes sense to waive the Hubbard or Sale Contingency from your offer to make it more attractive. Congratulations on getting an accepted offer! Your buyer’s agent will work with the seller’s agent to circulate a transaction summary to the lawyers representing both parties. This transaction summary is often called a deal sheet. As soon as the lawyers are in touch, the seller’s attorney will prepare a draft purchase contract and contract rider to send to the buyer’s attorney. Your lawyer should also request any due diligence materials such as a copy of the original offering plan and building financial statements as soon as possible. Your lawyer will review and negotiate the contract on your behalf and conduct legal and financial due diligence before you sign the contract. Remember that real estate offers are not binding in New York for each respective party until they sign the purchase contract. Therefore, it’s quite possible that the seller may have accepted multiple offers without your knowledge. It’s far too common for the seller to have multiple contracts out with different buyers. This hedges the seller’s risk that they’ll have wasted days of time if a buyer falls through. As a result, it’s important to understand that you don’t have a deal until the seller has received your signed contract and counter-signed the contract. In fact, nothing is official until your attorney has received confirmation of the seller having counter-signed the contract, and has received a fully executed copy of the signed contract. All of this means that you should move as quickly as possible if there are competing offers. You should push your attorney to finish due diligence and contract review within five business days so you can sign the contract within a week. Sometimes, it may be wiser to act even sooner if you really don’t want to lose an apartment. Pro Tip: You should always keep your options open even if you have an accepted offer. This is where having a great buyer’s agent comes in handy. Your buyer’s agent will advise you to keep looking and to put in multiple offers on different properties. This way, if it doesn’t work out on one, you have the option value of other potential properties. Don’t put all of your eggs and hopes in one basket! Nothing is for certain until the seller signs the contract, and even then there are contingencies that might cause the contract to be cancelled. Sellers have a tremendous advantage in real estate as long as they’ve priced a property correctly so that it doesn’t sit for too long on the market. That’s because they hold all of the cards when it comes to information and are the last to act in the contract signing process. That means a contract is not binding for the seller just because a buyer has signed a contract. In fact, a seller can still sell to someone else as long as they have not counter-signed a contract. The best tip for sellers who want a potential bidding war for their property is to price their property attractively relative to comparable listings on the market. The market for real estate in New York City is relatively transparent and everyone can smell a good deal. Furthermore, it’s critical to invest in professional photography, a customized floor plan and proper listing syndication to the REBNY RLS and relevant consumer search websites such as the New York Times, Realtor.com and StreetEasy. If you’ve done all of the above, then buyers will very likely be climbing over themselves to see your property. Once you have received your first offer and it’s become apparent that you will receive additional offers due to your apartment’s attractive listing price, you may wish to consider holding a best and final offer process. A best and final offer process can make your life simpler while also creating a competitive atmosphere. In fact, just announcing that there is a best and final coming up will make most buyers feel the competitive tension. Relatively few buyers will have the discipline to maintain their original bid and call your bluff if you don’t in fact have multiple offers. A best and final offer process is a great way to force all interested parties to put their best foot forward, now or never. Interestingly, if you don’t like the results of the best and final offer process, you can simply hold another one next week. There are no rules on how to hold a best and final offer auction! What Is the Average Flip Tax in NYC and Who Pays It?